In both cases, candidates must have qualities of high moral character, an active interest in aeronautics and astronautics, and an interest in the Sigma Gamma Tau. 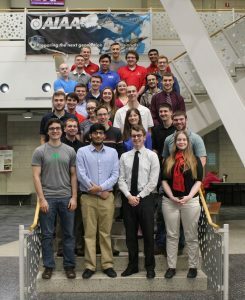 By recognizing this group of young aerospace engineers, Sigma Gamma Tau seeks to identify those from which future advances in the profession are most likely to come. *Graduate students seeking membership must be in good academic standing and have met similar requirements. For students who fall short of the requirements, a self-nomination can be put in to be approved by three-fourths of the active members with a stronger emphasis on exceptional qualifications outside of scholastic standing. The online application form can be accessed here.